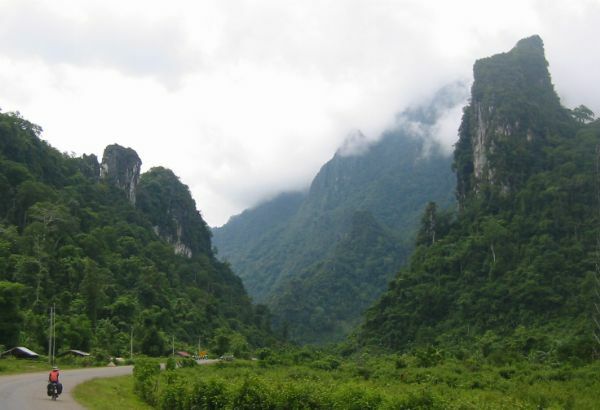 Heading south from Luang Prabang karst hills reared up in front of us. 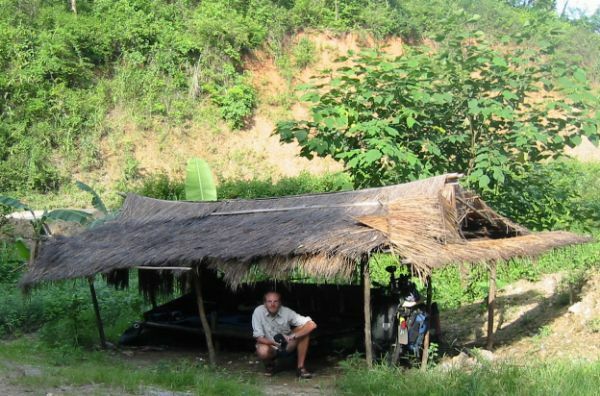 Guesthouses were too far apart so we bivied one night in a roadside bamboo shack. With our mosquito net (thanks Ali + Ingrid!) hung from the roof it was pleasantly cool and airy until a thunderstorm woke us at three in the morning and the roof began to leak! We were following one of the few sealed roads in Laos, which also features in a Lonely Planet cycling guide, so not surprisingly we met other cyclists. In fact we met more in a week than we had met in China, Mongolia and Russia put together! 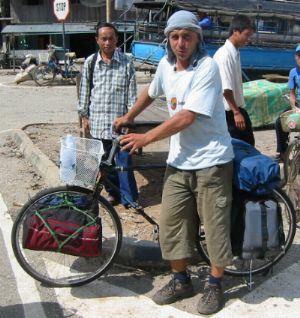 This is Robert from Poland who had bought his bike for $30 in China and ridden 6,000km so far. From Kiou Ka Cham to Vang Vieng we repeatedly met Martin from Austria who had just bought a bike in Luang Prabang. He was enjoying himself so much he was planning to continue through Vietnam and Cambodia to Thailand. We also met Steven cycling back to Wales from Australia, Patrick and Chris from Canada and several guys touring Laos. 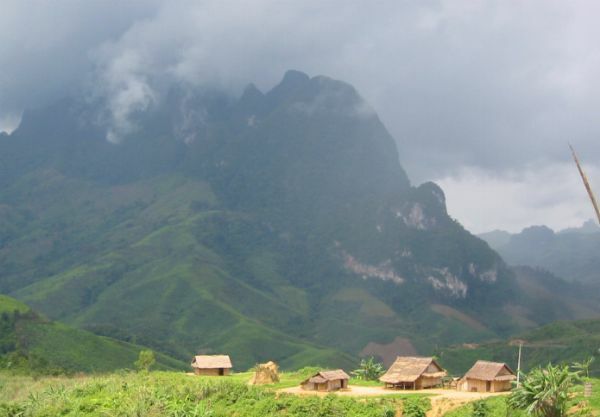 A typical Lao village near Kasi. 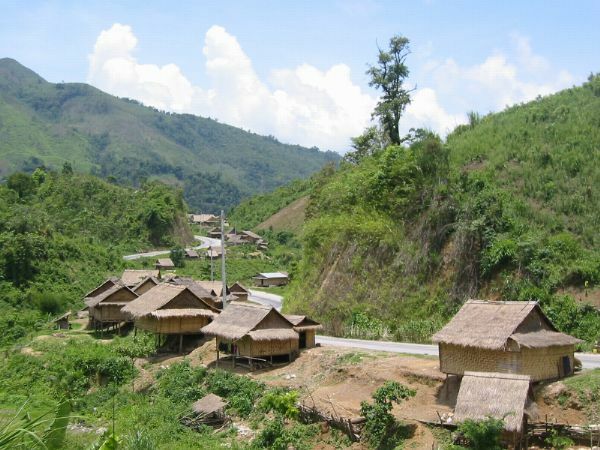 The houses are made with woven bamboo panels on a wooden frame and the roofs are thatched with grasses. They are perfectly waterproof when new and cooler than brick buildings with corrugated iron roofs. For 70c each we were given a couple of candles and pointed down a path. The path climbed over jagged limestone to a large cave mouth. Fortunately we met another couple coming back who lent us an electric light and warned us about the mosquitos that lurked near the entrance. Once inside we found ourselves in a 10m high, 5m wide passage that went straight into the mountain side. In one place red flowstone cascaded down the wall, in others there were stalagmites and pools of water. As the candles burnt down we left them on top of big rocks so we could see where we'd been. After twenty minutes we could look back and still see the light of the entrance with a line of candles leading to it. Then it was back to the river. People were stopping by the river bank to stock up on beers, smoke certain weeds and then leap back into the river from jumping platforms and swings. About half way down the river it began to rain heavily and actually got quite cold, except for those that had their "beer jackets" on. There were a few tame "rapids" but I think that the "unconfirmed reports of drownings" that the Lonely Planet mentions must have had more to do with people being drunk or stoned than the dangers of the river! 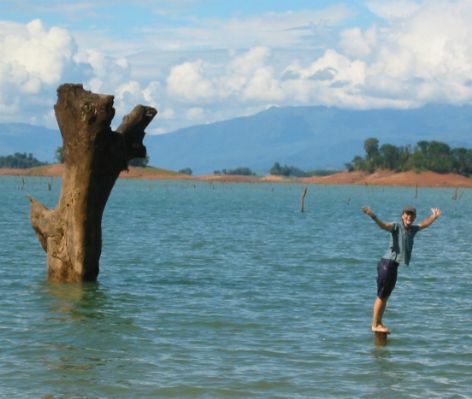 From Vang Vieng we pedalled to the Nam Ngum reservoir, created in 1965 to provide water for a hydro-electric scheme. With the red earth islands and hundreds of dead trees sticking up, the lake was one of the more other-worldly sights we have seen. 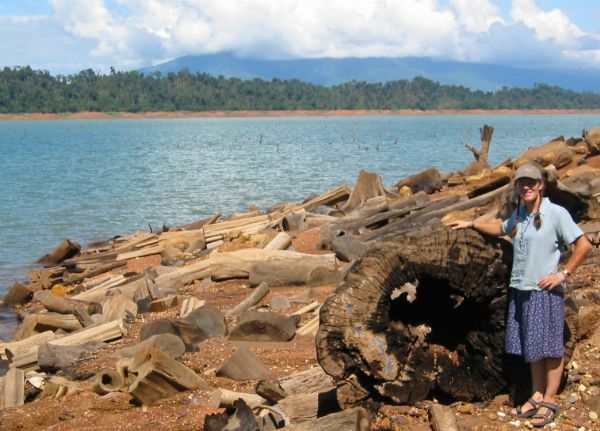 We spent a day in the lakeside village of Na Nam. 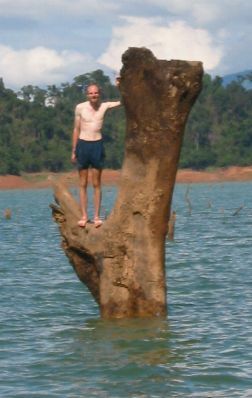 The shores of the reservoir were littered with hardwood driftwood from logging operations in the lake. Huge numbers of trees can be seen sticking out of the water and they are still being extracted by boats equipped with underwater cutting equipment, forty years after the area was flooded! The morning we left to cycle to Vientiane we started at sunrise because we knew it would be a long day and could be very hot. 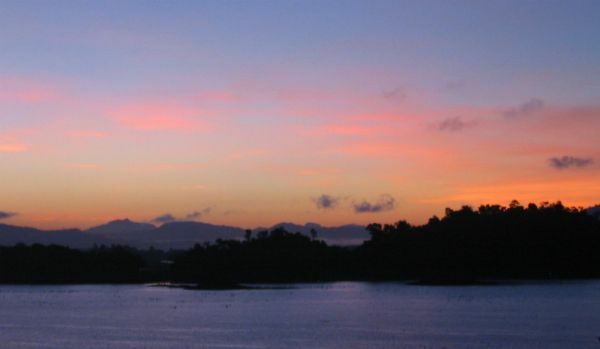 The sky was clear, not so good for cycling (the temperature reached 33°C by midday) but the sunrise was beautiful.